REACH Survey provides schools with a valid and reliable measure of key social, emotional and other factors that shape students’ motivation to learn. It will give you important insight on what enhances or inhibits motivation among students in your school. The REACH Survey can be administered one time to capture a snapshot of students’ academic motivation and the factors that influence it, or multiple times to assess change in students’ character strengths over time. In addition, the survey can be used as a tool in the evaluation of important projects and initiatives. Ensure that students know and are known for the deep interests and values in their Hearts. In-depth questions which go beyond school to look at how youth perceive relationships with their parents, friends, youth program leaders, and other school support staff (like counselors, principals, etc.). It helps provide a 360-degree look at the world students are experiencing. Survey purchasers also receive a copy of the REACH Strategies Guidebook with activities (called Anchor Activities) and strategies. Can be administered one time to capture a snapshot of the factors that influence motivation, or multiple times as a pre- and post-assessment to see changes. 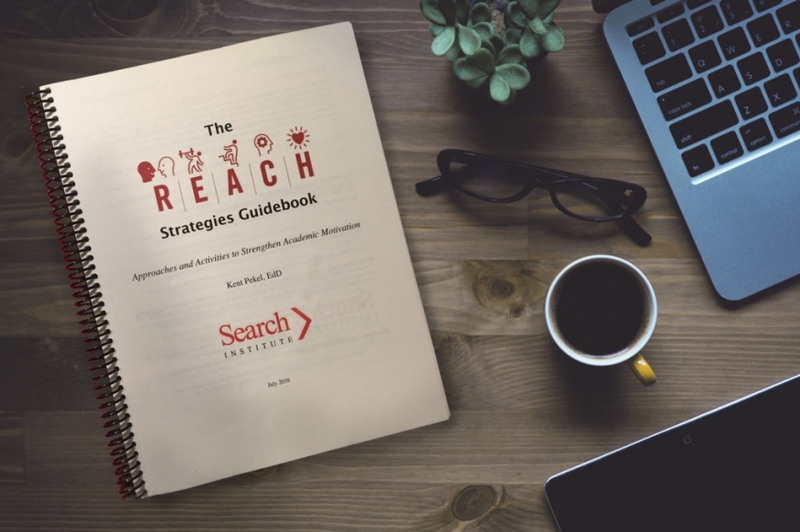 A pdf of the REACH Strategies Guidebook, which contains specific techniques that schools can integrate into their practices to strengthen students’ social and emotional skills. What's included in the Survey? Studies have shown that between 40 and 60% of U.S. high school students are disengaged from learning and don't put much effort into school (National Research Council, 2004). In fact, an extensive review of the scholarly literature recently concluded that, “Children’s interest, enthusiasm, and intrinsic motivation for learning in school deteriorate continuously from their entry into kindergarten until they complete high school (or drop out), with striking losses during the transitions to middle school and high school. The erosion of motivation is especially severe for boys and for students from low socioeconomic, minority, and immigrant backgrounds” (Skinner et al, 2012). This crisis of academic motivation is much on the minds of America’s teachers, 69% of whom reported on a recent national survey that low motivation is a major problem in their classrooms (Yeager et al, 2014). Fortunately, from grit to growth mindset there is a growing body of research that educators can use to strengthen students’ motivation to learn. Unfortunately, that body of research is large, complex, and sometimes contradictory. 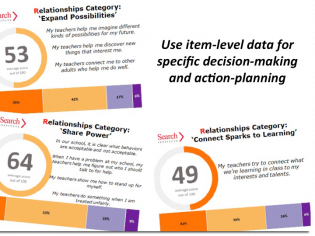 When using REACH’s research- and activity-packed Strategies Guidebook with the REACH Survey’s clear, actionable data, teachers can more deliberately work on reaching students and improving motivation. You’ll also have access to a thorough user guide for planning your survey administration, in-depth site reports and administrative support from our expert staff. Click below to order or click here to contact us to learn more! How does the REACH survey work? Get your results (click to see a sample of what your results will look like). Start planning your improvement strategy. “Our REACH survey results indicated that we should work to improve relationships with our seventh grade students, that our assignments must be broken down into smaller steps to keep motivation strong, and that we should give the students more voice in the curriculum. Three pilot studies of the REACH Survey have demonstrated promising predictive validity, with higher REACH scores correlating with better grades and intentions to attend college, and fewer class failures and suspensions. 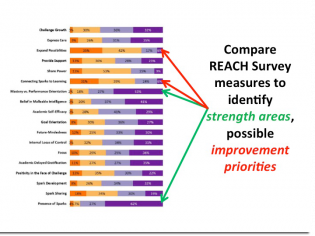 Internal consistencies were good to high among all scales in the REACH Survey. Using the REACH Survey The REACH Survey was designed to be completed by students in grades 6 to 12. The survey is written at a sixth-grade reading level* and includes approximately 85 questions depending on the version that students complete. Most high school students can complete the REACH Survey in 20 minutes or less, while most middle school students can complete the REACH Survey in approximately 30 minutes. Five minutes should be allowed to give students the instructions for completing the survey. During the pilot administrations of the REACH Survey, all students were able to complete the survey during a single class period and, in some cases, the students were able to complete the survey during a 30-minute advisory period. The REACH Survey is administered through Search Institute’s online survey platform. After students have completed the survey, Search Institute analyzes the data and provides schools with an executive summary that captures key findings and a detailed report that provides schools with data on all of the questions included in the survey. The executive summary is an appropriate document to share with all members of the school community, while the detailed report has been designed for people who have the time, expertise, and interest to delve more deeply into the data. Click here for psychometric data and a technical summary of the REACH survey.